SporoBot would increase the speed of production 20 – 30 times over. If you’re thinking has been influenced by the tech revolution, you would likely do two things: First, design a robot to help produce the vaccine, and, second, run a crowdfunding campaign to pay for it. That’s exactly what Sanaria, a biotechnology founded in 2003 by long-time malaria researcher Stephen Hoffman and based in a suburb of Washington, D.C., has done. First, some background. Malaria infects about 200 million people every year and kills 600,000 of them. Vaccines have been notoriously ineffective against the disease, which stems from a parasitical infection. Last year, Sanaria reported that in a Phase I clinical trial whose participants were consenting U.S. veterans, the vaccine administered at the higher of two doses kept all the patients who got it from becoming infected with malaria when bitten by mosquitos carrying Plasmodium falciparum, which causes 98 percent of all malaria deaths. This year, the company will conduct trials in the U.S., Mali, Tanzania, Equatorial Guinea and Germany. To produce the vaccine, called PfSPZ, Sanaria cultivates mosquitos in a sterile environment and infects them with Plasmodium falciparum(the Pf in PfSPZ). When the mosquitos are chock-full of Pf sporozoites (hence the SPZ), the company irradiates them to weaken the parasites. Workers then herd up the mosquitos, chop off their heads and squeeze out their salivary glands, where the parasites prefer to live the better to port over to the mosquito’s next victim. They retrieve the weakened parasites from these tiny glands, filter out other contaminants and gather them up into an injectable vaccine. If it sounds laborious, it is. Raising mosquitos in a sterile environment is a wild enough idea that another company’s efforts to do it to combat dengue fever earned a featurearticle in the New Yorker. Sanaria’s method faces the additional challenge that dissecting the little buggers is tedious. Researchers can dissect 2-3 mosquitos an hour, which is nowhere near enough to mass-produce a global vaccine. So two years ago, Sanaria began working with theHarvard Biorobotics Lab to develop a robot that could do the work faster. The work has to be done under sterile conditions to produce a vaccine that could earn FDA approval. Tenzer and Howe have succeeded in robotically performing each of the steps required to extract the irradiated sporozoites. Tubes gather up the mosquitos and microfluidics pathways extract the parasites from the bugs’ 100-micron salivary glands. Image processing provides verification at every step that the goop consists entirely of irradiated parasites. SporoBot would increase the speed of production 20 – 30 times over, according to Harvard and Sanaria. That makes more vaccine available at a lower cost, which is important for a disease that disproportionately affects developing countries. What’s left is to assemble the various functions into a single desktop robot, Tenzer told Singularity Hub. That’s where crowdfunding comes in. 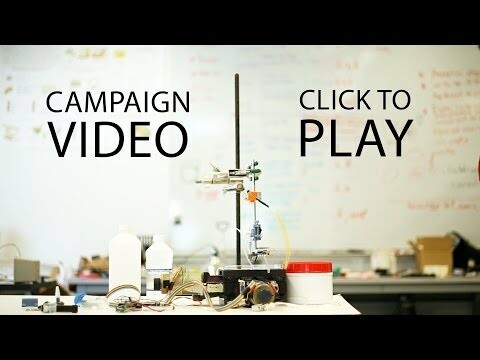 Sanaria is hoping to raise $250,000 by June 5 to cover the cost of a prototype robot. A fully functional industrial robot would cost $2 million, the company says. It’s easy to think that medical robots were last year’s innovation. But while they’re not a new idea doesn’t mean that all or even most of the medical endeavors that could benefit from robotic precision and efficiency have done so. If robotics manage to subdue malaria where other modern medical technologies have so far failed, it will be a powerful sign of how much the technology might accomplish as it matures.